The restaurant is part of Hotel Chankaya, which is located centrally in a busy area on Robertson Road. It's few yards away from Gandhi Road police point and just below Nehru Road (that leads to the Mall). You will see lots of cars parked in front of the hotel. You will usually need to walk between the cars to reach the entrance. The reception is right ahead as you walk in. The manager, a Bengali person will show you the restaurant which is on the left. Don't expect great ambience or food varieties. This restaurant essentially runs because food here is cheap and they prepare Bengali dishes including full meals or thali. So the restaurant is mostly frequented by the Bengalis who come from Kolkata. Most if not all the hotel guests are also Bengalis who usually prefer to stay in a place where they get their choices of food. While the restaurant is fairly large, but hardly impressive. There are massive pillars in the middle of the restaurant. 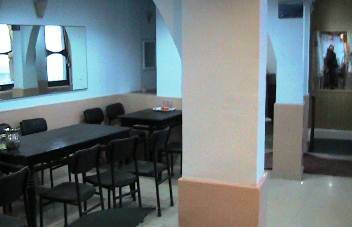 The wooden tables with typical sun-mica tops and cushioned wooden chairs are laid out across the floor. This is a cheap restaurant and therefore you can't expect much with the quality of furniture. A typical issue with a leased property like this is that the hotel owner tries to run it at a minimum cost. One plus point about the restaurant is its large windows on one side that open out to nice views of the valley and the mountains. If you are a Bengali and craving for Bengali food in Darjeeling, unfortunately there are not too many other places that serve Bengali dishes. Chanakya Restaurant serves full meal or thalis at a very reasonable price. The thalis (or full meals) can be with a choice of fish, chicken or egg curries. The common items in a meal includes steamed rice, dal (pulses), sabji (vegetable), papad, chutney etc. The chicken meal is costliest followed by fish and egg meals. The preparations are standard and nothing special. During peak time, the restaurant smells of curried dishes and cleanliness can become an issue. This is a typical 'come, eat and go' kind of restaurant, although during the high season you will find it buzzing with chats and giggles as people enjoy their food. 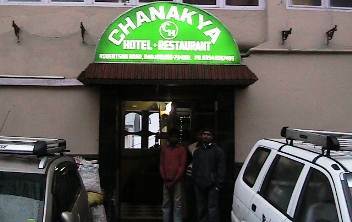 Chanakya Hotel & Restaurant is located on Robertson Road, yards away from Gandhi road police point and the Taxi Stand. It's located below the Nehru Road.